LAWN: Apply at a rate of 20 lbs per 1000 sq. ft. A fertilizer spreader is the easiest to distribute in large areas and ensures even coverage. Growin Green should be applied every spring, summer, and fall as maintenance. POTTED PLANTS: If mixing Growin Green into potting mix before planting, use at a rate of 2 tablespoons per gallon of potting mix. 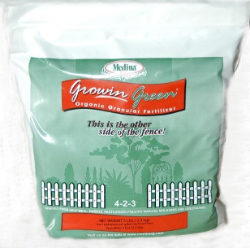 Thereafter, use 1 tablespoon of Growin Green as maintenance every other month. FLOWERBEDS AND VEGETABLE GARDENS: Apply at a rate of 30 pounds per 1000 sq. ft. every other month for maintenance. WILDFLOWERS: Apply at a rate of 15 pounds per 1000 sq. ft. at planting time and prior to budding out. ROSES: Apply at a rate of 2 ounces per Bush.